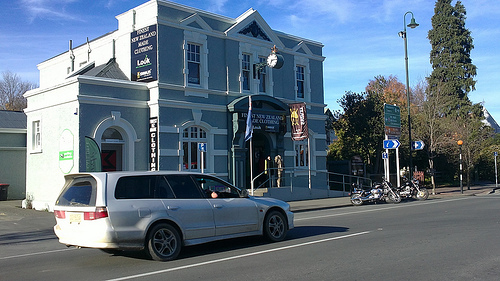 Wanaka to Christchurch – taking the scenic route. If you’re leaving Wanaka for Christchurch, whatever you do, take the scenic route! This will be a six-hour drive but you’ll get some lovely sights along the way. 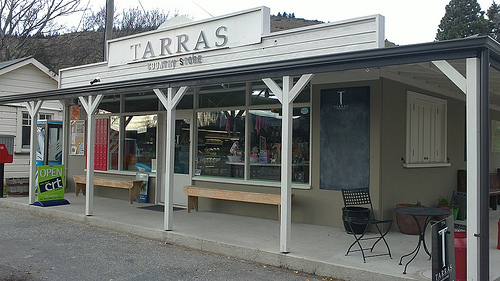 The first stop travellers tend to make, is at Tarras. The great attraction here, is the small settlement of very specialized shops. You’ll find a wool shop specializing in pure Merino clothing for the whole family. The General Store next door has a great country vibe – its a wonderful place to browse. What you’ll also get is that rural town friendliness from the shop staff. The ladies here often come from farming backgrounds. So they have an incredible knowledge of the food they’re selling – and more importantly, how to cook it. They’re usually expert cooks themselves. Check out this sample South Island itinerary. But there’s more down an alleyway between the General Store and Tarras Woolshop, the SHREK MUSEUM! Shrek was a Merino Ram, now deceased, that once sported the largest pelt ever recorded in New Zealand. There is this little museum honouring Shrek. 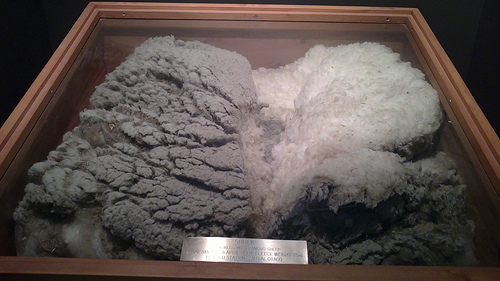 The pelt on display is enormous and definitely worth a look. Drive on towards Omarama and stop at the Wrinkly Rams Cafe/Bar. The coffee here is good. You’ll will get something to eat that you really enjoy. You won’t be driving very far out from Omarama before you catch sight of the majestic Mt Cook. It will probably stop the conversation for a while. Look out for the sight of harrier eagles as they catch the wind currents – they’ll often create picture perfect moments. Your next stop will probably be at the lovely little rural town of Geraldine. We love visiting Geraldine. It serves as the rural business centre for the area. But perhaps more importantly, for travellers, it is home to the iconic Barkers shop. Barkers is famous for quality jams and chutneys. The last time we visited, there was a great little gem of a museum in the main street. The museum has a wonderful display of historical photos. But what might really capture your eye, is the clothing from the early settlor days, right through to the 1920’s. Visitors are encouraged to use the massive old telephone switchboard. The locals have done us proud with this hidden gem. Wot? And miss out Twizel? We have it all. Great restaurants,cafes and gift shops, highly rated B’n B accommodation, mountain views, walks, bike rides and fishing. It’s a good base for Mount Cook, Tekapo and Lake Ohau, a hidden gem. The town has shaken off its hydro construction town reputation and property growth shows huge confidence. Next time, turn of SH8 and pay us a visit. Hey Mary & Jim, wot, miss Twizel out? – no, due to time restraints we didn’t have time but will cover Twizel when we do our Mt Cook blog in a couple of months so get that scone recipe out and we’ll be there with bells on!